If I am lucky during the week I sleep 7 hours a day. That adds up to 35 hours of sleep from Monday to Friday. What I do more than sleep is work. I compare work to sleep, because the only thing other than work that we do for almost the same amount of time in this world is sleep. Also, the abstract people, places and things that I dream about offer more to me than my work environment. From Monday to Friday most of my mental state is spent on waiting for my life to start. My to do list in order to keep my sanity grows longer and longer through the week. It seems like I don’t have time for anything. I do not mind working in an office .That is not what bothers me. It is the time spent not enjoying my life that bothers me. I remember working in retail years ago. Some days I would work 14 hour shifts. The job itself was depressing, repetitive and lacking much needed respect, but I made memories. My days mattered. Every day I showed up to the party that is my life. I laughed every day and was surrounded by people who I cared about and cared about me, genuinely. Not once did we make small talk. Our talks were always big. Not once could I conceal my feelings, someone always cared. Someone always knew. Not once did I find myself on the verge of a nervous breakdown for anything other than the death of a family member. In the coming months I plan on moving out of my apartment to live with someone that isn't self-centered. To live with someone that sees me. In the coming months I plan on taking classes for life coaching. But right now I need to feel as if I am showing up to my life. To be invited to such an amazing ongoing event and rarely show up is worse than not being invited at all. It is the feeling you get when you are all alone on a Saturday night while you sit within earshot of a gathering. We are alive; our main priority in life should be to live. We must live. This Saturday I went to a yoga Solstice event. The instructor said something that stuck out to me. She said that all we want as humans is to be seen. I know plenty of people who are happy regardless of where they are, because they are surrounded by people that see them for who they are. To be seen is to be known. It is the reason why family is so important. This is a bond that relies on the ability of everyone to be seen for who they are. This is the main reason why I began to write. I wanted a place where I can be my full self and not be seen as anything other than me. The person whose writing I read the most is my own, because there are aspects of myself that need reflection. Everyone has aspects that need reflection. We are social creatures who must find like minded individuals to reflect off of so that we can see ourselves clearly and in the process understand each other. People like to say that life is short; in fact it is extremely long. It is longer than it’s ever been. The reason why we think this way is because most of us live a life where the majority of our days we could do without. 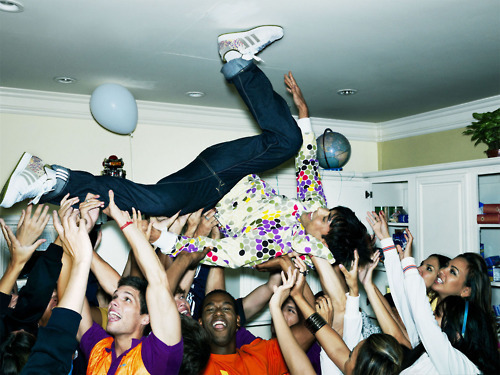 Show up to the party that is your life, you are responsible for the cleanup either way, so you might as well enjoy it.